Trees That Feed co-founder Mike McLaughlin is a Physics major (BSc, University of the West Indies). He designed this hybrid solar dryer, to dehydrate fresh fruit and preserve it with a long shelf life. The first live prototype in Jamaica is now in operation at Sydney Pagon High School, in St. Elizabeth, Jamaica. This project was funded jointly by TTFF and Rotary Clubs in Canada. In this design air flows in through three solar collectors painted black and covered in plastic. The air warms over the hot collectors and flows into the cabinet. Shelves inside hold the fresh fruit, sliced or shredded for quicker dehydration. A solar fan on the roof pulls the moist air up and away. A full load of fresh fruit can be dried in 4 to 6 hours! Learn more: click here to watch a 30 second video explaining more details. 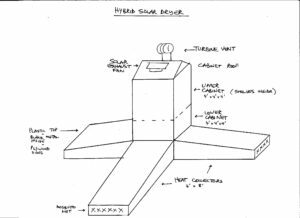 This schematic sketch is being converted into high quality engineering drawings by Northwestern University’s Engineering School. And remember we have a complete detailed descriptive paper on the design and testing. Click here to learn more. This entry was posted in Blog, Jamaica, Solar Dryer. Bookmark the permalink.